I've written a lot about bicycle gearing , and you'll find links to many different articles of mine on this page, but I have mostly focused on the more practical aspects of gearing. This article will be devoted more to the theory of gear selection, and derailer gearing. Cycling is not a single, unified activity/sport/transportation mode. Different people use bicycles for drastically different purposes, and they will have equally drastic differences in terms of what gear choices will fit their riding style. How much effort you are willing to put into maintaining your bicycle. There is no magic formula for this: only experimentation will let you determine what gearing suits your needs. That's an easy one, the answer is: one. If you encounter a hill that is too steep, you can always get off and push. If you get going faster downhill than you can pedal, you can coast or brake. Thomas Stephens rode a high-wheel bicycle around the world over a hundred years ago. This bicycle had only one gear, and a fixed gear at that! The issue of "need" just doesn't enter into it. Most people reading this article don't actually even need a bicycle, but use it for convenience in transportation, or for recreation. With multi-gear bikes, the total number of gears is not as important as many people suppose. More important is the actual ratios of the gears. If you can't climb steep hills, it isn't necessarily that you need more gears, more that you need a lower low gear. You can have the gears closely spaced, so you can fine-tune your gear to something close to ideal for level cruising, but then you may not have a high enough high or a low enough low for steeper conditions. You can have a wide range to get you up and down the steep hills easily, but then when you're cruising along you may find that the jumps are too big. One gear may be just a bit too low, but the next gear up may be just a bit too high for comfort. With today's 7, 8, 9, 10, 11, 12-speed cassettes and internal-gear hubs with as many as 14 speeds, this is much less of an issue than it once was, though. Efficiency relates to how far/fast you can go with the least expenditure of energy. Many people ride bikes primarily for exercise, and for those people, a bit of inefficiency just means they get a bit more exercise. Short-distance commuters/utility cyclists don't usually care much about efficiency either, it just doesn't matter in a short, un-hurried trip. Trials and freestyle riders don't care a bit about efficiency. Competitive riders in short-distance, non-aerobic events, such as BMX or track sprinting don't particularly care about efficiency in gear usage, they don't care how tired they get if they are fast. Riders who don't care that much about efficiency are most often better off with singlespeed, internal-geared or fixed-gear bikes. Such bikes can be a lot of fun, are light and lively, and require much less maintenance than multi-speed bikes. Touring/randonneur cyclists want to be able to cover as much ground as possible, while conserving their energy so that they can keep pedaling usefully even after many hours in the saddle. Commuters with medium-long commutes care about getting where they're going in a reasonable amount of time, and, often, not working up a sweat while doing so. Racers in longer-distance events don't want to exhaust themselves only to be left behind at the final sprint. For most cyclists, efficiency does matter, but is not the only priority. Cadence refers to the pedaling speed, in revolutions per minute. Resistance is how hard you must push on the pedals to keep them turning. The idea of gears is to select the gear in which this combination of cadence and resistance is met. Depending on the wind, grade and surface conditions, your speed may be faster or slower, but theoretically your legs should always be pushing against the same resistance, and spinning the cranks at the same cadence. To maintain maximum efficiency, your high gear should be high enough that you can still have enough resistance, and not have to spin too fast a cadence, even when going down the steepest hill you would pedal down. Your low gear should be low enough that the resistance doesn't increase and the pedal cadence doesn't need to go down, even though the bicycle may be slowed to a crawl on the steepest grade you would normally climb without getting off to push. You should have an infinite number of gradations in between these two extremes so that you can exactly fine-tune your gear to the varying conditions of the road. In practice, there is only one such gear system, the NuVinci hub. It is outside the budget range of many cyclists, and rather heavy. A good, practical system will have as high a high as you'd want, as low a low as you'd want, and well-designed intermediate steps, in a pattern that will be easy to remember and to shift. A chain drive is one of the most efficient mechanical linkages there is. This is true as long as the chain runs in a straight line, but derailer gears don't always run the chain in a straight line. As you select gears that run the chain at an angle, the efficiency drops somewhat as the angle increases. For this reason, you should favor combinations that allow the chain to run nearly straight. Generally, the large outer chainring shouldn't be used with the largest rear sprocket, because of the sharp angle it creates. Similarly, the small inner chainring shouldn't be used with any of the smaller rear sprockets. The small-small combinations create extra problems besides the bad angle. The smaller the front chainring, the greater the pull on the chain; the smaller rear sprockets only engage a very few teeth with a very few chain rollers at any one time, so stresses are concentrated. If you make a habit of abusing the small chainring of a triple crank by using it with the smaller rear sprockets, you will drastically increase the wear rate of both chain and sprockets. Sometimes cyclists get hung up on the idea that it is important in selecting sprocket sizes to find a combination of cluster and chainwheels that avoids duplication, so that every combination of front/rear sprocket gives a distinct and unique ratio. This may have made sense back in the days of 4 and 5 speed clusters , but with modern gear systems, it is of no practical consequence. Indeed, having a few gears duplicated can often help to simplify the shifting pattern! When you do encounter duplicate gears, in almost all cases, one of the combinations will involve running the chain at an extreme angle, so you should generally use the other one. The fact that the bad-angle gear is a duplicate doesn't matter, because you shouldn't be using it anyway. How should the gears be distributed through the range? Some people assume that the gears should be evenly spaced from highest to lowest. This looks good on paper, but is not ideal in practice. Instead, it's better to have the gears closer together in the high range, with bigger jumps toward the bottom of the range. Unless you cycle mainly in the mountains, you'll be spending most of your time in medium-high gears, so you should have reasonably close jumps in that range, that will allow you to fine-tune your gearing. At higher speeds, most of your work is going to overcome air resistance. Air resistance, unlike mechanical friction, varies with speed. In fact, air resistance varies with the square of the speed, and the power needed to overcome it varies with the cube! Thus, if you go twice as fast, you need to generate 8 times as much power to overcome air resistance! If your gear jumps are too large in the high range, you won't be able to get going fast enough in one gear to be able to spin comfortably on the next one up. Back in the old ten-speed days, lots of bikes came with 52 tooth chainrings, and freewheels that topped out with a 14-17 jump. It was common for people to decide that the 14 was useless, because they could never get going fast enough with the 17. When they would shift to the 14, their cadence would drop too low for efficient pedaling, and they wouldn't be able to maintain their speed. As clusters with more gears became the norm, and such big jumps were eliminated, people found the higher gears much more useful than they had previously been. At the low end of the range, close spacing is much less important. As you start to climb a hill, your pedaling cadence drops, until you must downshift or stall. There's always a slight loss of momentum involved in making a shift, and if the jumps are too small, a single jump may not be worth the loss of momentum. When you get over the top of the hill, and start to accelerate up through the gears, you aren't facing much resistance as you shift out of your climbing range, and you don't tend to spend much time in any gear until you're back up to cruising speed, so largish jumps in the low range aren't a serious detriment either going up or going down. Also, take note that a jump of a larger number of sprocket teeth is needed to achieve the same effect with larger sprockets. A two-tooth jump, 14 to 16, achieves the same step size as a 4-tooth jump, 28 to 32. The ratio in both cases is 7 to 8. But, because wider steps are desirable in the lower range, you might do better, for example, with 27 to 32. A well design cassette will have jumps in tooth count which are not only larger, but also proportionally larger, between the larger sprockets. People often want to number their gears sequentially, and will sometimes speak of "7th gear" or "13th gear." There is, however no standardized way to designate gears in sequence by a single number. If you wish to give your bike's gears sequence numbers, that's fine, but don't expect to be able to communicate with anybody else using those numbers. Most of the time, you'll want to be shifting either the front or the rear derailer, but, unless you are running a pure crossover shift pattern, there will be times that you'll need to do a double shift. This can either be done by shifting both front and rear derailers simultaneously, or doing one first, then the other right away. Shifting both at once requires more skill, though with modern bicycles that have indexed shifting and the controls on the handlebars, it's nowhere near as tricky as it used to be. Different bikes have different sprocket sizes front and rear, and the specific sizes of sprockets selected are chosen with a view to the needs, conditioning and skill the manufacturer expects the target "average" buyer to have. Virtually all stock bicycles in current production come set up for multi-range gearing. Experienced cyclists traditionally customize the gearing of their bicycles, by selecting a different rear cluster or swapping out one or more chainrings in front. In this way, you can make a bicycle more suitable for your needs. The difficulty and expense of adjusting the gearing varies widely depending on how a bicycle is equipped initially. Fortunately, most modern rear wheels on bicycles with derailers are equipped with a cassette freehub, and it is easy and relatively inexpensive to swap out cassettes (sprocket clusters). There is less flexibility in cranksets, especially, racing cranksets. If you are installing larger sprockets or a small chainwheel, you may have to replace a derailer, and if you are installing a cassette with a different number of speeds, you will usually have to replace the shifter. With half-step gearing, the larger shifts were made with the rear derailer, and the front was for fine tuning. This allowed an 8- or 10-speed set up to have a reasonable range with fairly close spacing of the gears. Half-step uses all possible combinations, including those that run the chain at a fairly severe angle with a bad chainline. This was kind of marginal for 10-speeds, with the wider sprocket spacing and stiffer chains of the time..
Another disadvantage of half-step is that every other shift in the normal sequence is a double shift (front and rear derailers simultaneously). A great many cyclists bought into the concept of half-step or half-step-plus-granny gearing based on reading about it, but then found the complicated shift pattern inconvenient in practice. The many double shifts were especially difficult with the downtube shift levers prevalent at the time. Cyclists would then use the gears as if the bike were set up with crossover gearing, and wind up enduring unpleasantly large rear jumps. Modern shift patterns use larger jumps on the chainwheels to select general ranges of gears, and fairly closely-spaced 7-or-more-speed clusters for the fine tuning. This simplifies the shifting pattern, allowing constant adjustment to different grades in rolling terrain, with only occasional need for a double shift. However, it is often necessary to "fish" for the right gear after shifting chainwheels, and the jumps are not as nicely-spaced as with half-step. With today's improved equipment, half-step deserves another look, and it will be discussed again later in this article. A variant on the half-step system is "half-step plus granny." This refers to a setup with a triple crank, where the larger two chainrings are close in size, for half-stepping, and with a much smaller "granny" chainring, typically in the 24-28 tooth range. The idea is to use the half-step gears for general cruising, and to have the granny chainring as a "bail-out" gear for the serious hills. "Alpine gearing" is a slippery term, because it has changed meaning over time. Originally, "alpine gearing" referred to a system that provided a very low climbing gear separated by a big gap from the gearing in the cruising range. For example, my 1957 OTB came with a 4-speed freewheel, 14-16-19-26. The idea was that most riding would be done in the 14-16-19 sprockets, which are generally fine for flattish terrain. The big jump from the 19 to the 26 tooth sprocket would not give a smooth progression, but when faced with a major climb, the availability of the lower gear would be more important than a smooth shift progression. Another older definition of "alpine gearing" was any system that involved a 36 tooth or smaller chainring. The waters were muddied in the late '60s when the term "alpine gearing" was co-opted by marketeers, and applied to the 52-40/14-28 gearing common on "bike boom" 10 speeds. These systems would be more appropriately called "crossover gearing." As front derailers improved, larger differences in chainring size became workable without requiring great rider skill. By the early '70s, 52-tooth chainrings were commonly matched with 42-, 40- or even 39-tooth rings. This gave an improved overall range, but a confusing shift pattern. Typically, the jump between the chainrings would be larger than any of the freewheel jumps, but not a lot wider so a double-shift would not be absolutely needed. Crossover gearing provides a fairly simple shift pattern, just use the front derailer by itself when you are near the middle of the range on the rear cluster. The downside of crossover gearing is that it creates lots of duplicate or near-duplicate gears. On a system with few rear sprockets, this will usually compromise either range or fine-tunability. Multi-range gearing involves chainring differences that are much larger than the jumps on the rear cluster. The idea is that you use the front derailer to select a general gear range, and use the close-ratio jumps in back to select various gears within the range. Typically these systems call for double shifting when going between ranges, if you're concerned about a smooth gear progression, but most shifting is done with the rear alone. The multi-range system is commonly associated with 8-/9- or 10-speed clusters, but can be used with fewer rear sprockets and a wide-range double chainring setup. I've long favored this approach myself. For instance, when my OTB was a 2 x 5 "10 speed" it had a 51-28 crankset, with a 14-24 freewheel. I used a slightly shorter than normal bottom bracket axle, to make the 51 tooth chainring line up with the middle of the rear cluster. This let me use all 5 gears with the 51 tooth ring. As a result, the 28 tooth ring could only work with the two or three biggest sprockets, but that was OK. Most of my riding was done on the 51 tooth ring, keeping my shift pattern simple and smooth. When I would come to a serious climb, I had the small chainring to get me up it. This was basically a variation on the "alpine" concept. Below is a photo of a later version, with a 6-speed freewheel. Even today, my Hetchins is equipped with a 50-28 double crankset and a 12-28 9-speed cluster. I find this setup extremely convenient, but you will never find a stock bike set up this way, because it isn't "idiot proof"--If a clueless rider were to try riding in one of the small-small crisscross gears, it would not work at all well, so no manufacturer could offer this as a stock setup for fear of warranty claims. Multiple sprockets may be mounted on an internal-gear hub. The hub serves the same purpose as the front derailer and chainwheels of a multi-range system. 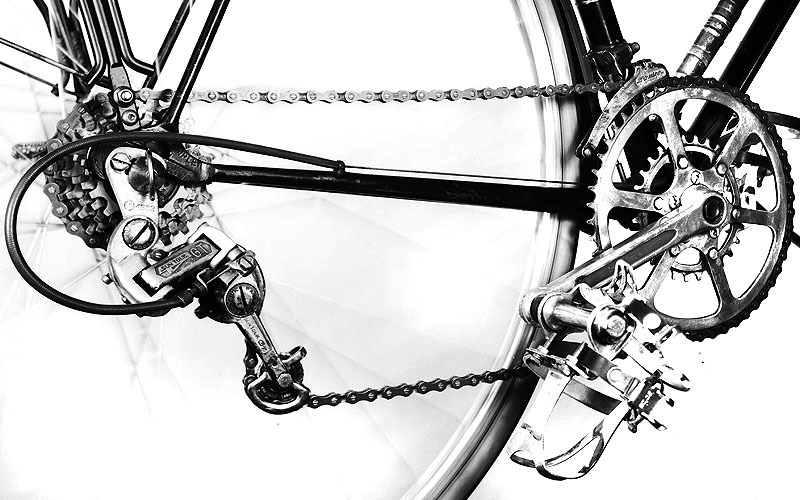 In the mid 20th century, before wide-range front derailers became available, hybrid gearing was the most practical way to achieve a wide gear range. Three-sprocket clusters were manufactured, to replace the single sprocket on a three-speed hub. These clusters used 1/8-inch wide chain, compatible with the chainwheel of a three-speed bicycle. A number of tinkerers, present company included, built up clusters with 4, 5, 6 or even 7 sprockets using narrower chains -- for example, see Sheldon's Moulton Mark 3. A hybrid system is usually heavier than an all-derailer system -- but is easier to shift. The hub can be shifted at a stop, useful in urban riding. On a small-wheel bicycle, the hub's increase top gear avoids the need for an extra-large chainwheel or small sprocket. There is more about hybrid gearing in the article about internal-gear hubs. Today's narrow, flexible chains and narrow-spaced cassettes handle the chain angles fine with the 6 or 7 sprockets of a half-step system. A narrow-cage racing front derailer accommodates the small step between the outer and middle chainwheels. This derailer shifts better than derailers that must be used with wide-step triple chainwheels. An 11-13-16-19-23-28-34 tooth 7-speed cassette and (for example) 24-42-46 tooth chainrings achieve an extremely wide range with even, narrow steps. Shifting only the rear derailer gives reasonable steps when accelerating, unlike with a a multi-range system. There also is less dishing of the rear wheel than with an 8- or-9-speed cassette, for a stronger rear wheel. The outer and middle chainwheels are centered over the cassette, even when a granny chainwheel is installed, increasing cornering clearance and reducing the "Q factor". You can always tell by the position of the levers how to shift to the next gear, without looking -- except, of course, with brake lever shifters that return to the same position after every shift. Indexed bar-end shifters or top-mount shifters are the ticket with half-step, making double shifts easy. The front lever usually isn't indexed, but positioning it by hand works fine, with only two or three steps. Half-step gearing is most suitable for road riding, especially in flat terrain, where long distances must be covered in the same gear, allowing fine gradations to get closer to the ideal gear for the particular wind conditions. Half-step doesn't make much sense for choppy up-and-down off-road riding. A half-step system today is definitely a tinkerer's project. No manufacturer offers an appropriate cassette -- so, it is necessary to mix and match sprockets. 7 sprockets can be installed on an 8/9/10 speed cassette body with a spacer, but only a shorter, older 7-speed cassette body lets you reduce dishing of the rear wheel. 8-speed Shimano bar-end shifters (which work with 7-speed spacing and a slight alternate cable routing) may be a special-order item. 8-speed chain works with 7 speeds, it is widely available, and it is more robust than 9-speed chain. It is to be hoped that some manufacturer will make all the needed equipment available, as SRAM and Sturmey-Archer have done with hybrid gearing.